The origin of the Bouguereau surname arose in the high Middle Ages and certain specialists in genealogy suppose that the family name is similar to the word bogue or “chestnut husk”. That is to say; that the name is associated with “chestnut”, although that does remain conjectural. Genealogical research on William Bouguereau’s family does not reach earlier than the beginning of the 16th century when a certain Macé Bouguereau, living in La Rochelle, married a Dame Bastienne Briot around the year 1530. It is from that union that the lineage of William Bouguereau descended. Let us point out, for the benefit of non-European readers, that La Rochelle, the capital of Aunis, is an old harbour city of moderate importance in the départment of Charente Inférieure, subsequently renamed Charente Maritime. Historically La Rochelle was reputed to be the center of French Calvinism thus earning the name la Geneve Francais. Traditionally Catholic and Protestants intermarried freely here and young men traditionally took the religion of their fathers and young girls that of their mothers. The descendants of Macé Bouguereau, little by little, formed family bonds with the Calvinists, of which there were traditionally many in La Rochelle. Those who remained in Charente after the revocation of the Edict of Nantes held, for the most part, official posts in the city. Many, for example, held positions in the mint up to the time of the French Revolution. 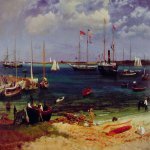 The last of the line to do so was Jean Élie Bouguereau, Chief Minter for La Rochelle. 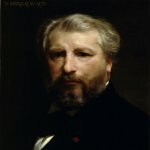 Jean Élie was the father of Samuel Élie Bouguereau, professor of English, who was the father of eight children, of which Théodore would become the father of the painter, William. On the 30th of November, 1825, the same year as the ution of the famous “four sergeants” William Bouguereau was born, second son of Théodore Bouguereau and Marie Marguérite (sic) Bonnin, herself a young Calvinist. Five years later, William was baptized into the Catholic faith. The couple then lived on the rue de Duc near the port. The head of the family was a small businessman who ran a wine store but his business at best eked out a living. Early in 1828 the family moved from the rue de Duc to the rue Saint-Claude area and Madame Bouguereau gave birth in March of the same year to a girl whom they named Marie Adeline, but nicknamed Hanna. In 1832, the family left for Saint-Martin; principal town of the isle of Ré, where Théodore thought he would start a business on its port. William was enrolled at the local school, and already his classmates were talking about the innumerable drawings that literally illuminated his notebooks and school texts. In spite of the new move and the good reputation of Ré wines, Théodore’s business never thrived and it was this chronic situation that doubtless caused the atmosphere in the family to languish, depressed, heavy and tense. Endless quarrels compounded their difficulties as the family’s finances placed them in dire straights. Mired in economic worry, yet always wishing to spare the children scenes of their violent disagreements, the young couple sent them off to stay with relatives. Eugène became his surrogate father and mentor, sharing with the young man his love of Latin and French literature and encouraging him to develop an interest in classical culture-an interest that the painter continued to pursue his whole life. Of course, religious instruction was not neglected and William spent hours reading the Gospels and Lives of the Saints. He also had ample leisure for daydreaming; stretched out on the grass, observing the flora and fauna, the passage of clouds, or the heavenly bodies in the evening. It awakened in him a feeling of wonder for the works of nature, which he never lost. Eugène also introduced the boy to hunting and riding. Together they would frequently explore Saintonge on horse-back, visiting the monuments and historical sites of this beautiful region. In 1839, Eugène decided to send his nephew to study the classics at the college of Pons, a religious institution administered by a friend of his. William adapted easily to the ascetic conditions of the boarding school and made good progress. While pursuing his religious studies, the young man was introduced also to ancient history, Greek and Latin mythology, and to the fables and poetry of Longus, Ovid, Virgil, and doubtless, Pausanius, an author he loved well. While living with his uncle he perhaps had only a taste of this new universe, but it never ceased to captivate and enchant him. These myths and legends were the rich source from which grew his “fantasies”-foundations of what he imagined and painted to the end. He received his first true drawing lessons here from Louis Sage, a young professor who had been a pupil of Ingres and was a committed classicist. Sage instilled the precepts of Ingres in his students, warning them against the seductions of the romantic ‘heresy’ and presenting the life of an artist as an endless competitive struggle. Bouguereau’s later convictions were rooted in this rich soil. He became convinced that persistent hard work was necessary in order to gain a superior mastery over the technical problems which could have shackled the free reign of his imagination.